The second Visitor Center at Kluane Lake gave us some more informations and Bear Containers. These Bear Proof Containers had to be carried in case bears were smelling your delicious food. In the field each of us carried two containers with food. Traversing Duke River Bridge and we arrived at a parking site for the beginning of the trip. Everything was packed accordingly to not forget anything at the car! It was already late in the evening, nevertheless we walked the first couple of kilometers with slight rain. There was a trail so far and we worked our way upward in the national park direction. Very soon we realized that the midges were really hungry. 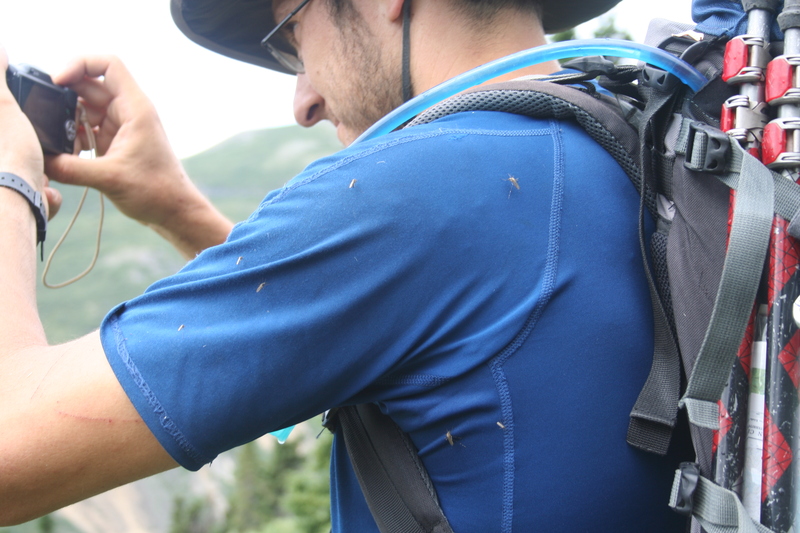 More than 30 Midges per arm is just to much, but the DEET did its work. Midges! Even worse than what you see here. We settled on a large plateau in between the tundra with shrubs all around. Our first experience with Safety arrangements against bears was done. Cooking Place, Tents and position of the Smelling stuff (Food, DEET, Suncream etc.) should have a distance of at least 30m in case a bear gets curious. Panorama in the tundra from our elevated tent position.